After accidentally releasing it to the world last week, Facebook has now officially unveiled Slingshot, a curious new app to come out of the company's Creative Labs division. Widely rumored as a Snapchat competitor, Slingshot certainly has an ephemeral element -- all of the photos and videos you send using it are easily removed with a simple swipe. But while Snapchat is a messaging service for one-on-one conversations, Slingshot is more about sharing that moment with lots of people at once. In a sense, it's an impromptu social network that encourages spontaneous communications. But there's a catch -- if you want to see what your friends have shared with you on Slingshot, you'll have to reciprocate and "sling" something back. It's perhaps the only social app we've heard of that requires 100 percent active participation, and that's at the core of what makes Slingshot so very unique. Slingshot was started in one of Facebook's December Hackathons last year, where employees were encouraged to come up with new Creative Labs apps. Creative Labs, if you don't already know, is a division within Mark Zuckerberg's domain that's encouraged to come up with new and innovative apps that exist outside of the core Facebook ecosystem. It's a way for the firm to explore new forms of social connections and see what sticks without mucking about with its bread and butter. Creative Labs' first-ever product meant for such a mission was Paper, a dedicated newsreading app that's more immersive and visually richer than the company's primary offering. After testing it over the holidays, Facebook decided that Slingshot would be the second standalone app from the internal startup initiative and a team of 10 people started to work on it full-time in January. Six months later, it's now ready for release. "It's an app where everybody's a creator and nobody's just a spectator," Will Ruben, Slingshot's product manager, tells us. "That sort of dynamic creates a space where there's really low pressure to create, because when everybody's a creator, there's no pressure behind creating." Another thing that he wanted to impress on us is that Slingshot is not a messaging app. "It's an app for sharing with lots of people at once," he says. "I frequently sling shots to not one or two people, but 20 or 30 or 40 people, because I have shots to unlock from them that I'm going to get to view and because for those whom I don't have shots from, it's me telling them that I want to hear what they're up to, too." Here's how it works. You sign up on Slingshot using your phone number, after which you can decide to find friends through your phone's contacts list or through your Facebook login. Importantly, you don't need a Facebook account to sign up for the service, though obviously it's easier to find friends if they're all using the social network. You can also choose to find a friend on Slingshot through a username if you can't find him or her through the other two methods. 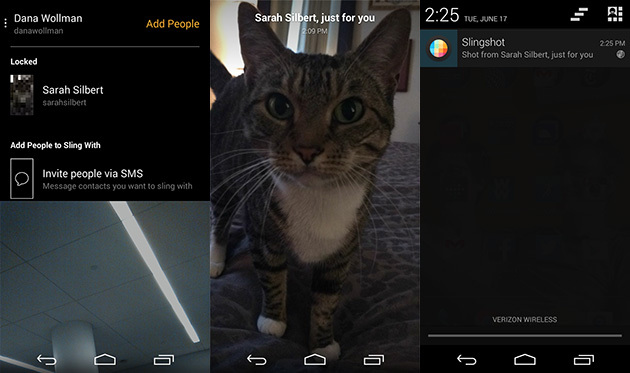 Just like Snapchat and Taptalk, the first thing you see when you launch Slingshot is that it automatically starts the camera. The three standard camera controls are Flash, Shoot and Selfie, all of which are fairly self-explanatory. Once you snap a photo, you're immediately taken to the retouch view, where you can reshoot, use the shot you've taken or add a caption or doodle to the image. Your username and the location and time of when the shot was taken are automatically added to the header. If you decide to enter a caption, you can either leave it in small text at the top, or you can drag and drop it to the body of the image to make the text larger. If you're feeling creative, you can also tap Draw, which launches a color picker on the side. You can scrub up and down to change colors and left and right to resize the brush. Videos are limited to 15 seconds, and they loop when you play them. As you're doodling around on your photo or video, you might also notice a soundtrack playing in the background. Joey Flynn, Slingshot's product designer, explains that the team actually went the extra step to work with a sound designer to come up with a whole list of custom sounds for the app so that it feels like a "fun and enjoyable place to create." Indeed, even the act of sending off a shot prompts a slingshot sound effect. After you're done creating your shot, you can hit "use," which will bring up what the Slingshot team calls the "sling view." It's essentially a list of all your friends who use Slingshot, with the people who've slung shots to you listed at the very top. Remember what we said earlier about how you can't view people's shots until you've reciprocated? Well, those photos and videos that your friends sent are still "locked" and therefore appear pixelated. If your friend sent multiple pictures, a number will show on that thumbnail indicating how many of them remain unseen. Now, here's where the core "slingshot" action comes into play. If you want to unlock all of those images from all of your friends in one swoop, you can do so by sending just the one shot that you took. Of course, you can also send the photo or video to just a few friends, or to people who haven't slung any shots to you as well. But the idea that you can unlock several images in one fell swoop is one of the reasons Slingshot is really more of a "blast" or group-feed app, rather than a simple messaging one. "You typically want this moment shared to a bunch of people -- it's how it works best," says Flynn. When you finally do get to unlock those shots, you'll see those pixelated images dissipate, leaving behind a clear image of what your friend captured. Like many other ephemeral messaging apps, you can then swipe them to remove them for good. If you decide you want to react to a particular post, however, you can tap on it to send what's called a reaction shot. It'll bring up a half-screen view of a camera with the original still in the background. Unlike regular "slingshots," these reaction shots are already unlocked and don't need to be replied to in order to view them. Additionally, those reaction shots are instantaneous -- just hitting React will send the response, without any chance for a preview or confirmation screen. If let's say you do get a ton of spammy Slingshots from someone, you can choose to hide that person. Also, if a shot goes unlocked for more than 30 days, it'll disappear. When asked why they thought the reciprocal part of the app was so important, Flynn explains it. "What it does is that it makes it so that everyone feels that they're involved in the community. When you share something, you know you're going to get some stuff back, and you're also unlocking stuff ... There's this cool connectedness you get from that. It makes you feel close with the people you're slinging shots with." "The blast dynamic where you're sending to lots of people at once, these little moments that you share end up being shared experiences too," says Ruben. Contrasting it to Instagram or other photo apps, he says, "What you share on Slingshot ends up becoming way more spontaneous and authentic. It's something that you share in the moment. It's not the best picture that you took, but it's just [the] in-the-moment, spontaneous window into your life." He adds that there's also a storytelling element to it too, as you can also send multiple shots of a day at the zoo, for example, and have your friends relive that experience along with you. Based on our first day with Slingshot, it's the kind of app that grows on you. Initially, the interface is a bit tricky, as switching between the camera and your friends page isn't very intuitive. It wasn't immediately clear that long-pressing on the Shoot button takes you to video mode, or that tapping on the bottom of the screen brings up the camera. The experience should be even better when more friends jump on board -- hopefully more of our Facebook contacts will sign up soon. Once a few Engadget editors started exchanging photos and videos, the process became a bit addictive. The stream of random photos and videos is also a little hilarious once the pace of sharing picks up. One coworker did say that being forced to respond with a photo sounds more like a deterrent than an encouragement, but it's also an opportunity to get creative when you're bored. And if you're busy when you receive a video or photo, the locked message gives you something to look forward to when you have some down time. 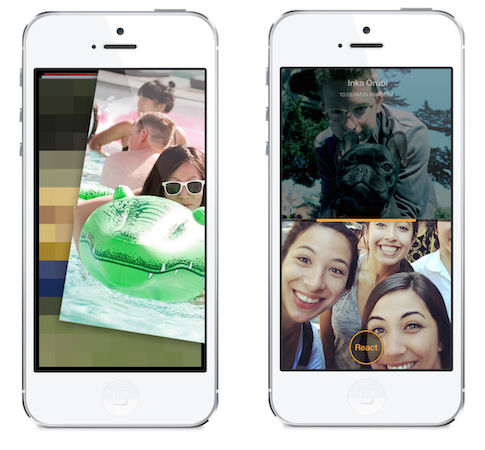 The addition of the Slingshot app to Facebook's arsenal does signify that the company is willing to step outside the box. The fact that Slingshot doesn't absolutely require a Facebook login is significant, and it shows that the firm is willing to experiment with alternative means of engaging with the community. If Creative Labs' mantra is to discover new ways to share, Slingshot is most certainly that. It's available on iOS and Android starting today and only in the US at this time.